Welp, I did it. I tried rusks again. They didn’t turn out that different from the first time, so here’s what I learned: they’re supposed to be crumbly and anyone who can create rusks that don’t deconstruct into a million pieces when you try to cut them is clearly some kind of sorcerer. I suspect I’ve had it with rusks. I don’t even really like to eat them. But my self-pity isn’t what concerns you, is it? I’ll tell you all about my rusk baking experience, and then put this whole ugly business behind me. The reason trying to bake rusks was sort of important to me, is that I’m South African. Or, more specifically, I’m part Afrikaans. Rusks are a South African staple food because they’re a quick snack that’s quite filling, and don’t go stale easily. This is the batter with milk added. 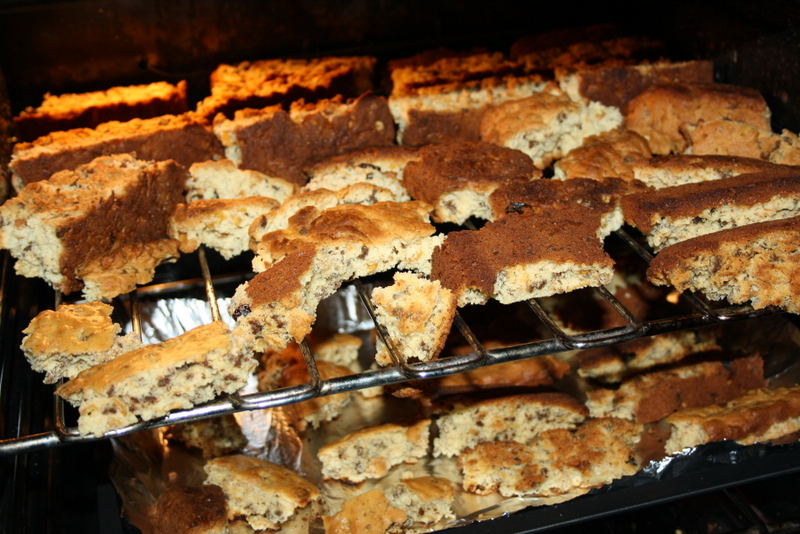 Rusks, like biscotti, are baked twice, and dipped in liquid to soften. They were eaten during the Great Trek because of the reasons mentioned above. Also, they’re delicious. Now let me tell you my rusk tale. I did a few things differently. First, I used all the ingredients exactly as I should have. I used margarine, not butter, I used buttermilk, not milk and lemon juice, etc. I still don’t know where I’m supposed to get Raisin Bran and Honey Crunch, so I made do with shredded bran, raisins, and honey Corn Flakes. Another thing, which I think is quite important, is that I used baking paper instead of just buttering the pans. This means the rusks didn’t stick, so they didn’t break. I could slide the loaf out of the pan and peel the paper off at my leisure. I split the batter in two, to experiment with moisture. The first batch I left as is. With the second, I added milk until it was runny. They both turned out pretty much the same. I looked online at some recipes to see what I was doing wrong, but one said crumbly is normal and that was all the proof I needed. The reason I had to look online for that info is that I don’t come from much of a rusk-baking family. We eat them now and then, but… Eh. 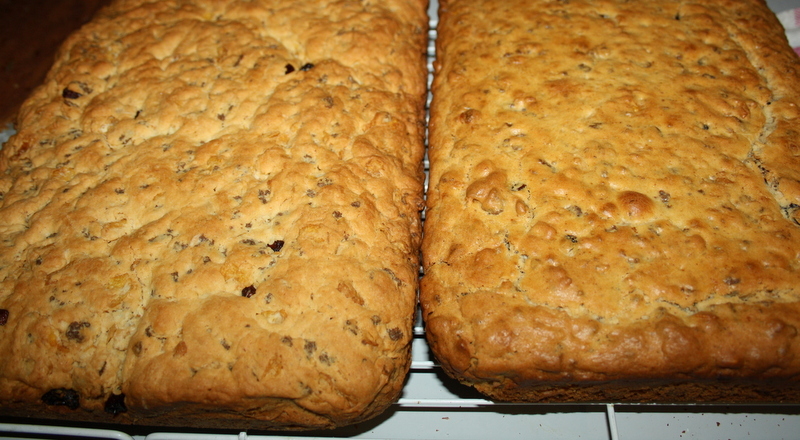 The reason I probably won’t be making these again is that my kitchen is a mess, and I’m not particularly fond of rusks. Sure, I’ll eat them if they’re there, but I don’t feel compelled to keep tubs of them on hand. On this batch, the yield is far too large (I filled two bread pans, a Pyrex dish and a roasting pan). If you’re Mother Hubbard, sure, make these. If you live in a one bedroom flat with your husband who hates rusks, don’t bother. Just buy Ouma instead. I guess that’s what you get for exploring your heritage. No milk added (left) vs milk added (right). Slight difference. 1. Set oven at 180°C, and line 3-4 bread pans with baking paper. 4. Sift together dry ingredients (excluding cereal and raisins) and add to saucepan. Blend well. If batter isn’t runny, add milk or buttermilk until you get a gloopy consistency. 5. 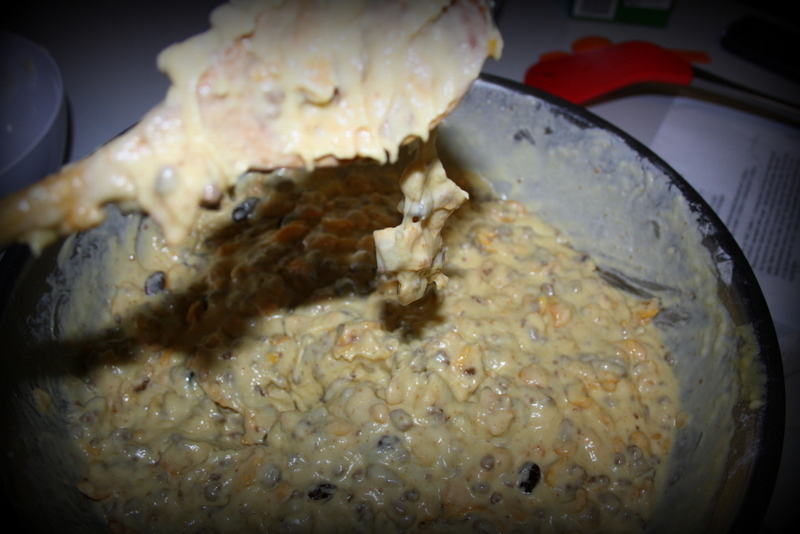 Add cereal and raisins, stir to mix, and pour into pans. 6. Bake for about one hour. 7. Flip rusks from pans and allow to cool down completely before cutting. Cut into pieces smaller than the mouth of a coffee mug. Don’t worry about the crumbs – it can’t be helped. 8. Place separated rusks on oven racks and dry out overnight at 100°C. Insert a wooden clothes peg to keep oven door slightly open. Make sure the bottom rack has a large baking sheet on it, to catch crumbs – when crumbs hit the element of the oven it fills the kitchen with a burning smell. Okay, they look kind of delicious. Next Next post: Eggs. Not the edible kind.